This is Jonah Tuttle. 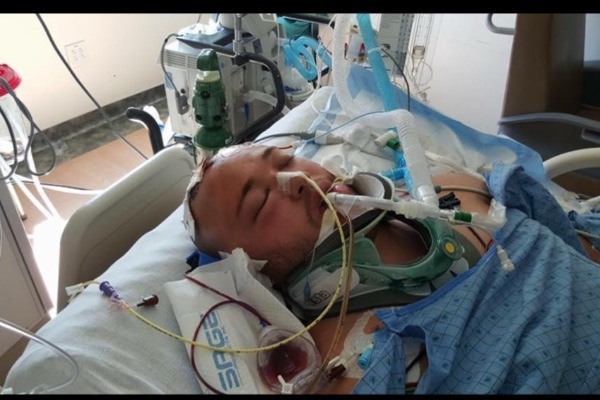 He was involved in a longboarding accident on Sunday April 17, 2016. He was transported by LifeFlight to DRMC. He broke his skull in 7 places and suffered a major traumatic injury to his brain. He underwent two surgeries so far and had a piece of his brain removed. The Tuttle family is an amazing family who will help anyone so please please send money to help them with medical costs. The cost of LifeFlight transportation is about $30,000 base rate alone, not to mention all the hospital and surgery costs. My goal is to raise enough money to completely cover all medical costs for them. A donation account is also set up at Wells Fargo Bank if that is how you prefer to donate. If we can get over the goal that would be great due to the fact that GoFundMe will take 5% of the donations raised. Please donate!! Jonah and his family need your help!! Hello everyone. Thank you so much for donating! Jonah is getting a little better each and every day but the financial burden on the family is still there so please please keep donating!!!!!! Thank you to all of you for what you've don't so far but let's keep making a difference!! Jonah - keep fighting the good fight! Praying and sending love to Jonah, and the entire Tuttle family! Love you all! We continue to pray for you and for Jonah everyday. We love you guys and know that the Lord is in charge and oversees all. Wishing you and your family peace and healing at this difficult time! Keep on fighting!